Why does the Soda Fire make me so sad? 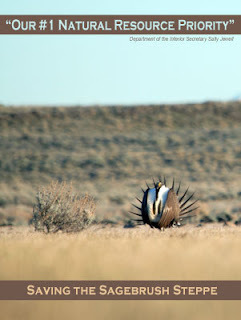 Our entire sagebrush steppe ecosystem is in trouble. We're not just talking about protecting sage grouse. We're talking talking about protecting more than 350 species of plants and animals (including mule deer and pronghorn antelope), and protecting a way of life for ranchers who depend on the land for their livelihood. I recently attended a 4-H Wildlife Habitat Education Program contest in Alabama and learned that prescribed burns are a necessary part of maintaining habitat for quail. In many places, where forests replace cotton fields, quail are thriving in the low brush and shrubs. As the forests continue to grow into dense stands of hardwood, the population of quail decreases. To restore habitat for quail, the first thing land managers do is thin and burn. When we talked about preventing fire in sage grouse habitat, the idea was not intuitive to our audience. Both here and there, we're talking about smallish birds that love shrubs, right? Well, yes, but our ecosystems are entirely different. In Alabama, if you choose not to plant cotton on your acreage, the forest comes back. The sagebrush steppe my Idaho grandparents cleared to create farmland will never return to sagebrush steppe. If the land were left fallow, it would be covered by cheatgrass. Our beautiful big sagebrush simply can't compete with cheatgrass. When sagebrush burns, the nitrogen level in the soil increases for 3-4 months--and cheatgrass loves nitrogen. (Native plants? Not so much.) So the cheatgrass gets a foothold ahead of the native plants. And then? Right. Cheatgrass also loves to burn. Where once we had fires every 60 years or so, now the same land burns every 3-5 years. The more it burns, the more nitrogen we have in the soil, and the more the cheatgrass grows. It's a horrible cycle. Every time healthy sagebrush steppe burns, cheatgrass moves in. Because it takes 50-60 years to restore the habitat, and the ground burns every 3-5 years when covered with cheatgrass, we will lose the entire ecosystem without intervention. We're working on breaking that cycle, but the Soda Fire makes my heart ache. We're losing ground.